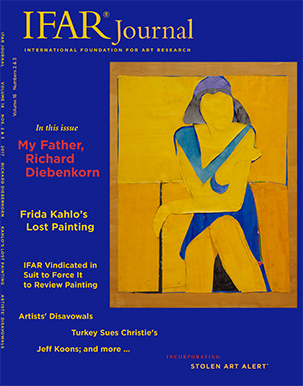 In an illustrated article, excerpted and edited from an IFAR Evening talk, the daughter of California artist Richard Diebenkorn discusses life with her father; his unique perspective on art and life; and his life-long admiration for and affinity with Henry Matisse. Based on extensive new research, two European art historians relate the backstory – exhibition history and mysterious disappearance – of Frida Kahlo’s largest painting, The Wounded Table, which was sent to Poland in 1954 for an exhibition in Warsaw the next year and has never been publicly seen again. Kahlo had donated the painting as a gift of friendship to the Soviet Union in 1945. Two art law attorneys discuss the case of LaRiviere v. Williams et al. concerning an unsuccessful lawsuit brought against IFAR by the owner of a purported Jackson Pollock painting who sought to compel IFAR not only to examine that work and undertake authentication research, but also to declare it an authentic Pollock and publish that in the IFAR Journal. Sixteen years earlier, the same individual brought a suit against the Pollock-Krasner Authentication Board concerning the same painting, which the Board said was not authentic. An intellectual property attorney discusses the recent phenomenon of an artist making a political statement by disclaiming authorship of a prior work of art. She explains that historically a disavowal by an artist was usually motivated by personal animus, or to prevent harm to his/her reputation, or to prevent the perpetration of a fraud. The author proceeds to give examples of lawsuits, both past and ongoing, concerning disavowals by famous artists, including Balthus, Cady Noland, Richard Prince, Arturo Di Modica, and others, and discusses how the Visual Artist Rights Act (VARA), which provides a framework for the “moral rights” of artists, factors in court decisions. A report on the fourth lawsuit regarding a work from Jeff Koons’ 1988 Banality series. In March 2017, a Paris court ruled that Koons’s sculpture Naked, inspired by a photograph by the late French photographer Jean-François Bauret, infringed on Bauret’s copyright, even though Koons’ work itself was not on view in France, only the promotional material relating to its planned exhibition. In an update of a story previously reported on in IFAR Journal, the artist Cady Noland has filed a lawsuit against the dealers, collectors, and art advisors involved in the sale of her 1990 sculpture Log Cabin, which she has disavowed due to objections to its unauthorized conservation. She claims infringement of her copyright and her VARA rights and has also made a claim under the New York Artists’ Authorship Rights Act. A report on a May 2017 lawsuit brought by the government of Turkey against Christie’s auction house in New York and the consignor, Michael Steinhardt, regarding the subsequently rescinded April 2017 sale of the “Guennol Stargazer,” an ancient marble sculpture of a female idol allegedly looted from Turkey in the early 1960s. The parties dispute both the textual accuracy of Turkey’s translations of its original 1906 Ottoman Law regarding cultural property and whether the 1906 Law was actually in effect when the Stargazer was allegedly looted. The defendants filed a motion to dismiss Turkey’s complaint. In July 2017, The U.S. extended for five years a Memorandum of Understanding (MOU) with Cyprus, which prohibits the importation into the U.S. of certain works of cultural property from Cyprus deemed at risk of pillage. In September 2017, the U.S. also extended for five years and amended its original MOU with Mali to prohibit the importation of certain additional types of archaeological material. Also in September 2017, the U.S. extended for five years and amended its MOU with Guatemala to restrict the importation of ecclesiastical objects dating from the early 1500’s to 1821, in addition to the existing restrictions on the importation of pre-Columbian artifacts. As reported previously in IFAR Journal, in July 2017 the government of Libya submitted a request for an MOU to assist in the protection of its cultural property. A report on an ongoing case in which the Mayor Gallery in London filed suit in New York Supreme Court against the Agnes Martin Catalogue Raisonné LLC and the members of its authentication committee, accusing them of unlawfully excluding from its forthcoming catalogue raisonné what the Gallery asserts are thirteen authentic Agnes Martin works that had been submitted by the Gallery’s clients to the committee for review. A report on the complicated lawsuit in which the estate of a prolific and posthumously renowned photographer, Vivian Maier, who died penniless and intestate, filed suit against a collector of Maier’s works, alleging copyright and trademark infringement. At issue is the distinction between owning artworks and owning the copyright to the artworks. The collector, Goldstein, founded “Vivian Maier Prints, Inc.” and acquired the domain name “Vivian maier prints.com.” The estate deemed those actions to be trademark infringements, as they illegally trade on the goodwill associated with Maier’s name. The estate also alleges copyright infringements, as Goldstein published two books of Maier’s photographs, licensed her image to the BBC without authorization, and sold unauthorized prints. Egbert Haverkamp-Begemann, a member of IFAR’s Art Advisory Council for four decades and the John Langeloth Loeb Professor Emeritus of Art History at NYU’s Institute of Fine Arts, is remembered by both IFAR’s Executive Director and Art Research Director for his connoisseurship and his valuable service to IFAR. Linda Nochlin, renowned art historian, member of IFAR’s Art Advisory Council, champion of women artists, and the Lila Acheson Wallace Professor Emerita of Modern Art at NYU’s Institute of Fine Arts, is remembered by IFAR’s Executive Director. Stolen items include Renoir’s Portrait of a Young Girl with Blonde Hair, stolen from a French auction house; William Kentridge’s Untitled (Starry Night), stolen in New York City; William Wegman’s One Dinosaur Plaza, stolen in Montreuil, France; Alexander Rothaug’s The Temptation of Saint Anthony, stolen in Genicourt, France. Missing items include Lucas Cranach the Younger’s Double Portrait of Martin Luther and Philip Melanchton, looted in Poland during WWII; Pierre-Louis Cretey’s Saint Jerome in the Wilderness, missing from a gallery in London, UK; two works on paper by Hans Bellmer, missing from an auction house in Cologne, Germany. Recovered items include Willem de Kooning’s Woman – Ochre, stolen from the U. of Arizona Museum of Art in Tucson; Henri Matisse’s Bust of Marguerite, stolen from a Swiss museum; three portraits by Francis Bacon, stolen in Madrid, Spain.